For ESPAR antenna (EA), the antenna elements in EA are placed close together, resulting in strong coupling among antenna elements. This coupling is exploited to control the currents at the antenna elements and the overall radiation pattern is shaped by varying the feeding voltage at the active element and adjusting the impedance of the parasitic elements. Therefore, ESPAR gives multi-antenna functionality utilizing a single RF chain and alleviates the complexity and implementation issues associated with standard multiple antenna systems. In the ESPAR antenna (EA) configuration, for some signals transmission, the input resistance becomes negative leading to oscillatory/unstable behaviour. We show that instead of these actual signals, one can transmit approximate signals and derive a simple closed-form expression, that enable an easy generation of the approximate signals at the transmitter. The EA utilizing this novel closed-form expression is denoted as EA with preprocessing (EA-P). According to simulation results, conducted for various communication scenarios, the EA-P transmitter provides significant improvement over the performance of the EA without preprocessing and performs nearly the same as the standard multi-antenna system (SMA). ​Additionally, we also study the impact in terms of energy efficiency (EE) of using EAs in the RRHs of a C-RAN, for both single and multi-UE systems. We derive closed-form expressions to obtain the EAs’ configurations to maximize the EE. We show that such EA-equipped system provides better EE performances while providing similar Symbol Error Rate (SER) performances as compared to a SMA. 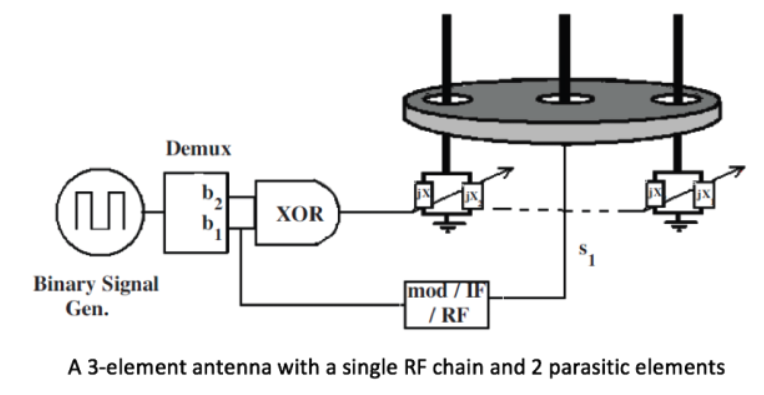 L. Zhou, F. Khan, and T. Ratnarajah, “Arbitrary Signal Transmission Using An ESPAR Antenna,” In Proc. IEEE International Conference on Communications (ICC), pp. 4919-4924. London, June 9-12, 2015.